The earliest depiction of the house is on the estate map drawn for William Serjeantson in 1776, which clearly shows a large, south facing "T" shaped building with formal gardens, occupying the approximate position of the present hall, which may well be the house built in 1668. 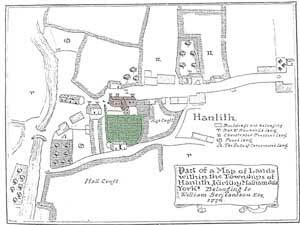 However the family fortunes increased over the years, partly by marriage, and from the early 18th century the family weren't really based at Hanlith, although they continued to own the estate. The family's principal dwelling from about 1720 was at Wakefield, situated near the Cathedral. Then in 1799 William Rookes Leedes Serjeantson bought a new estate, Badger Hall near Bedale, which he set about enlarging and renamed Camphill. This became the principal family seat until it was sold in 1889. In May 1826 George John Serjeantson visited his father's Hanlith estate where he found ".... all the farms much neglected and annually deteriorating in value. "** He dismissed the steward, appointed a new one and raised rents by 10%. With the main estate elsewhere it wouldn't be necessary to rebuild and maintain their second home in Malhamdale on such a grand scale. Hanlith Hall wasn't the permanent residence of any of the Serjeantson family, just a part of their estates, and at various times the Hall was was empty or tenanted. If improvements hadn't been made to it since the 1720s, and with the Prestons as tenant farmers they probably wouldn't, it would likely be a crumbling 17th century building by the early 19th century, requiring the remodelling the Rev Armstrong describes below.
" I slept the next night at Hanlith Hall, which is about a mile across the fields from the village (KM); the little place called Hanlith, hangs on the side of one of the environing hills.... There is a vulgar proverb related of Hanlith, which goes to say that the inhabitants formerly used to prop their milk bowls with 'three pound twelves,' (a species of coin) instead of tuff-cloths; those golden day's seem to have fled, and if we except one or two houses, and the Hall, which has been occupied by the Prestons, for more than a century, a few sinking cottages are all that remains to testify to its former opulence. The Hall has been partly rebuilt in the last few years and there is little, if any, remains of its antiquity, in the chamber which I occupied during my residence, there is an ancient drawing placed in a situation of the wall, which must have been made for its reception when the building was first erected.... There were also until lately, other vestiges of its priority; a monument to one of the Serjeantsons, to whom the estate belongs, and some other pictures were torn from the walls of the inner rooms by the workmen who were employed to carry out some repairs. " The Hall was a favourite summer retreat for the Serjeantson family in the 19th century and George Serjeantson may possibly have made some further alterations between inheriting it 1840 and his death in 1889. However these were not the external changes that give us the familiar frontage seen today however, these took place in 1892 when the house was totally remodeled. The earlier 19th century rebuild of the Hall, carried out by his father,William Rookes Leedes Serjeantson and seen in the picture of 1885, looks relatively modest, although there does appear to be a second range of building showing in the top right hand corner of the photo. It is not clear whether the west facing, original "T" shaped hall of the 1776 estate or the smaller, two chimney house which stood nearer the bridge, became the basis of this first 19th century rebuild, as no recognisable remnants can be seen in the 1885 picture. The house looks as though it may have been extended by one bay on the left hand side, possibly in the early 19th century, and only one original 17th century mullion window seems to be in place, to the left of the front door. The rest of the windows look as though they were enlarged in the early 19th century renovation work. The ornate moulded door frame which can be seen was reproduced in the late 19th century rebuild and the carving of the sergeant with halberd which is above the main door in this photo, or a reproduction of it, was incorporated in the front gable in 1892. As it was no longer a principal home for the Serjeantson family, which was at Camphill near Bedale, the Hall was at times rented out. 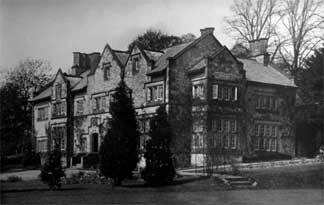 Mr Wharton Wilson (later of Eshton Hall) rented Hanlith Hall after his marriage in 1850, before moving to the South of England and later becoming a Baronet and returning North. George John Serjeantson offered the house and estate for sale in 1861, probably to help clear the estate's debts, but the house and the bulk of the estate remained unsold at that time and continued to be owned by the Serjeantson family until the early 20th century. George John Serjeantson died in 1889 and having no children he left the family estates to Elizabeth, the widow of his cousin the Rev James Jordon Serjeantson. She decided that one of the estates had to be sold and disposed of Camphill. In 1892 major rebuilding took place at Hanlith which added the familiar frontage we see today and turning Hanlith Hall into the building seen in the photo below. The work was carried out by Elizabeth Serjeantson and the estate's trustees, turning the 18th or early 19th century style house, into a mansion typical of the late Victorian period. On completion, the family moved back to Hanlith to live a leisured and unproductive country house lifestyle. 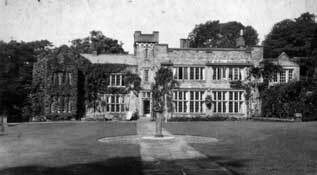 The Illingworth family first rented Hanlith Hall from Elizabeth Serjeantson in 1909, and later bought it , after having further extended the house and gardens with the agreement of Mrs Serjeantson. Although they didn't own the estate at the time, Dudley and Florence Holden Illingworth spent a considerable amount of money on the the building in 1911/12, greatly extending the East wing, adding more bedrooms, a belvedere tower and billiard room, as well as creating new gardens. Presumably the lease was very long or they had expected to be able to buy the Hall in the near future. The design of the 1912 extension originally had a gabled roof on the East wing, and this was partly built before being changed at the insistence of his wife, Florence. The final design had a tower and an upper storey of bedrooms with a flat roof, set back and masked by a parapet wall above the billiard room and study. The first design included this false gabled parapet with flat roofed sleeping compartments set back from the parapet. The re-design showing the plainer parapet and construction commencing on the belvedere tower. of 1912. This was later partly demolished to reduce the size of the house. 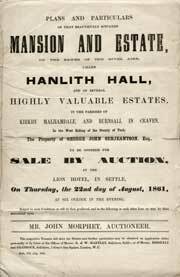 The sale of the Hall and Estate to the Illingworth family constituted the end of nearly 250 years of Serjeantson's occupation of Hanlith Hall, and also the end of the family's association with the dale, which had lasted for at least 500 years. Dudley Holden Illingworth maintained and improved the estate and it's buildings over the years and in 1923 he refurbished the Scalegill Mill dam, increasing its capacity, and installed a turbine generator in the mill to provide electricity for lighting the Hall. After the death of Dudley Holden Illingworth in 1958 the Hall and its extensive estate was again offered for sale, split into 16 lots and sold by Knight, Frank & Rutley in 1959. 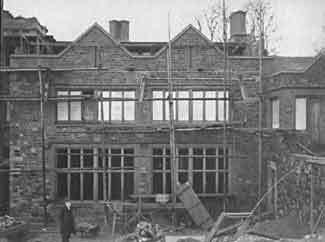 The house narrowly escaped the fate of many large country houses, as at the 1959 auction it was bought by a builder for demolition. After the sale William Bulmer approached him and purchased the house, and he and his wife Betty moved there from Holgate Head. 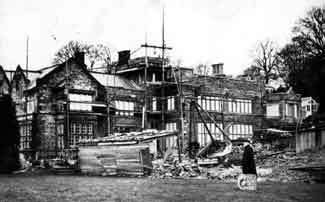 In 1962 they demolished the tower and removed the upper storey above the ballroom to make a more manageable house. 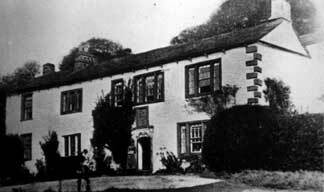 After completing the conversion of Badger Hill from what had formerly been the laundry and garaging installed by Dudley Illingworth, the Bulmers moved there and sold the Hall, retaining the estate, which was later sold in 1985 when Sir William Bulmer moved to the Channel Islands. Hanlith Hall has changed hands several times since then, but no further external changes have been made to the fabric of the building. Like all buildings it has continued to evolve and has acquired some of the necessary amenities for modern living, such as an indoor swimming pool. There are a some references in the early parish registers to a house or houses at the bridge end. These may refer to the two chimney one shown as belonging to the Serjeantsons in the 1776 map or the two smaller buildings closer to the bridge which may have been cottages. 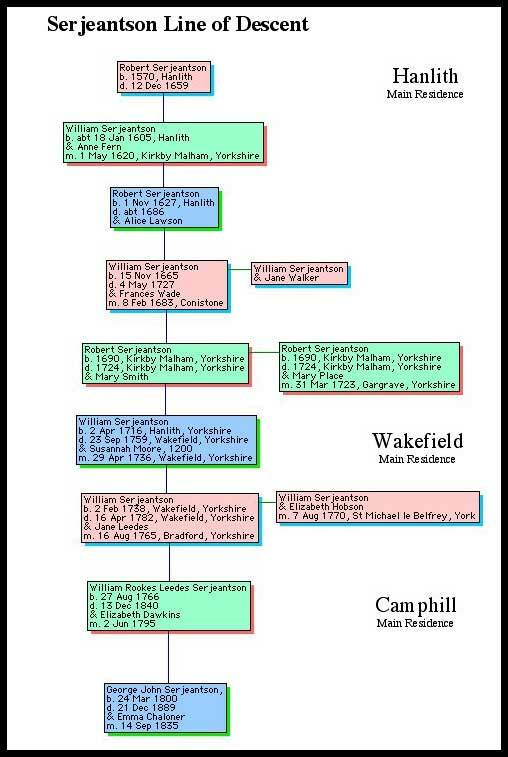 A more extensive pedigree for the Serjeantson family can be found on Meyricke Serjeantson's website.